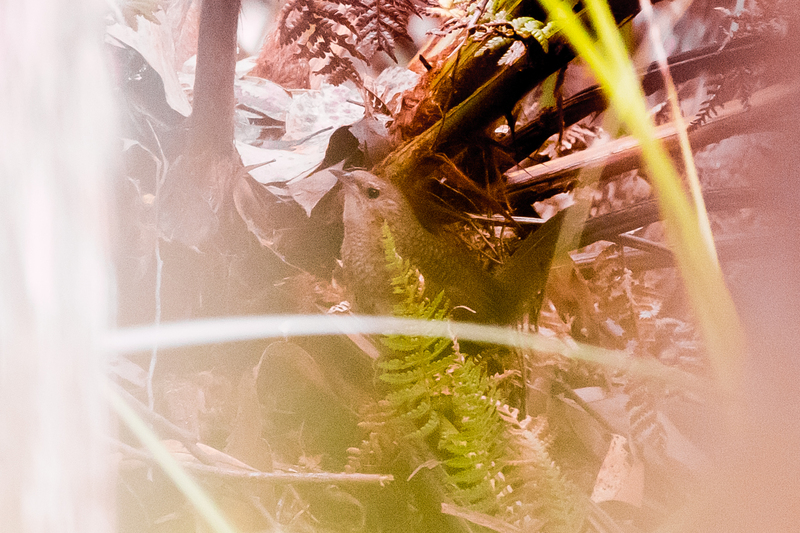 The Rufous Scrub-bird is an almost flightless bird which lives amongst dense ground cover and leaf litter in five high altitude areas in NSW and south-east Queensland. It is a species at considerable risk from climate change, as it has no way to escape the high altitude “islands” where it lives. Males have territories about 1 hectare in size, with territories usually spaced many hundreds of metres apart. It is not easy to see a Scrub-bird but the males have loud and distinctive calls and that is how we find their territories. Find ways to learn more about individual Rufous Scrub-birds (their biology and behaviour). Newman, M., Stuart, A. and Hill, F. (2014). Rufous Scrub-bird Atrichornis rufescens monitoring at the extremities of the species’ range in New South Wales (2010–2012). Australian Field Ornithology 31: 77-98. Stuart, A., Newman, M., Struik, P. and Martin, I. (2012). Development of a non-intrusive method for investigating the calling patterns of Rufous Scrub-birds. The Whistler 6: 24-34. Newman, M. and Stuart, A. (2011). 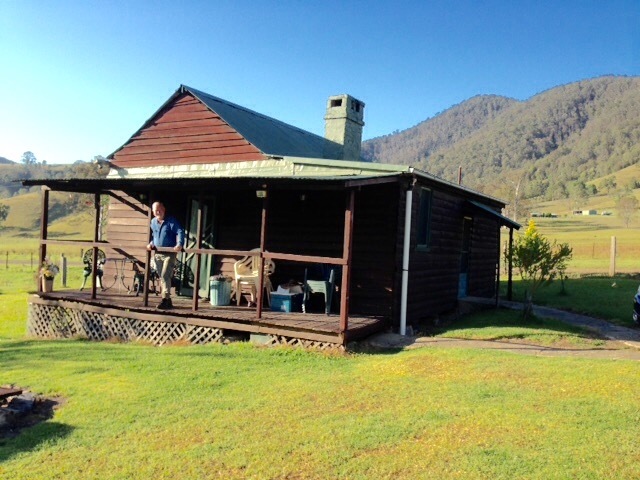 Monitoring the Rufous Scrub-bird in the Barrington Tops and Gloucester Tops IBA – a pilot study. The Whistler 5: 19-27. Newman, M. and Stuart, A. (2011). 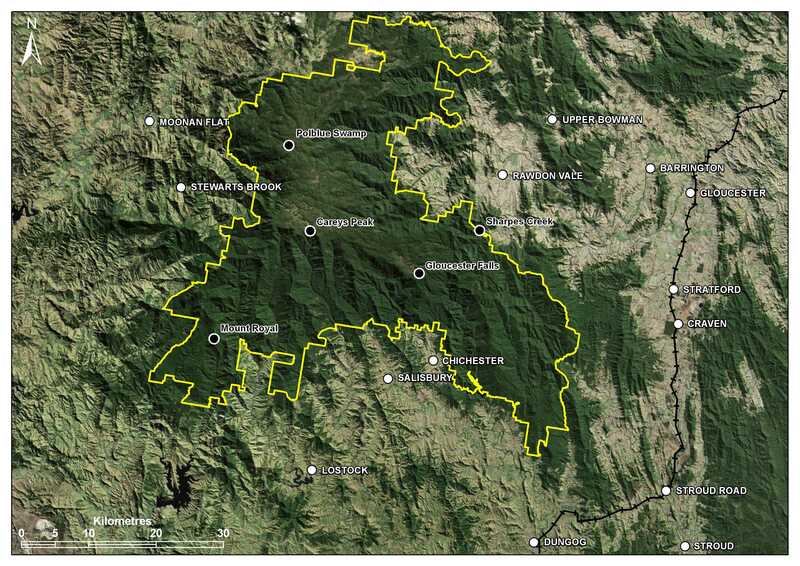 Monitoring Rufous Scrub-birds in the Barrington Tops and Gloucester Tops IBA in the 2010-2011 Season. Hunter Bird Observers Club Special Report #6. What have we learned after seven years of Rufous Scrub-bird surveys? (to the BirdLife Southern NSW & ACT Branch, March 2017). An altitudinal study of birds in the Gloucester Tops (Australasian Ornithological Conference, Geelong November 2017). Status of Rufous Scrub-birds in the Gloucester Tops (Australasian Ornithological Conference, Geelong November 2017, presented by Mike Newman). In March 2019 I was awarded a Wilma Barden Memorial Grant for my Rufous Scrub-bird studies. In mid-November 2018 we caught and banded a male Rufous Scrub-bird, and then a second male in early December 2018. After more than a year of planning, we'd done it! For Scrub-bird #1 the band details are: 042 84501 (metal band placed onto the left leg) and a yellow band placed onto the bird's right leg (i.e. using Schema 11). For Scrub-bird #2 we used Schema 1 i.e. a metal band (042 84502) on right leg, yellow band on left leg. I'm now quite confident that we can repeat the exercise on other birds as everything went remarkably smoothly both times. However, we weren't able to attach radio transmitters to either of the birds - in November because of a minor technical hitch and then in December because we discovered that the harness was too big (we were using a harness designed for Noisy Scrub-birds). We have made smaller harnesses now. I've enlisted some local bird banders into the team and in October 2018 we finally completed the training and approvals process in order to be able to band Rufous Scrub-birds and place radio transmitters onto some of them. When that happens, I will be able follow a bird as it moves around within its territory. Our training included to spend a week with the people in WA studying Noisy Scrub-birds. 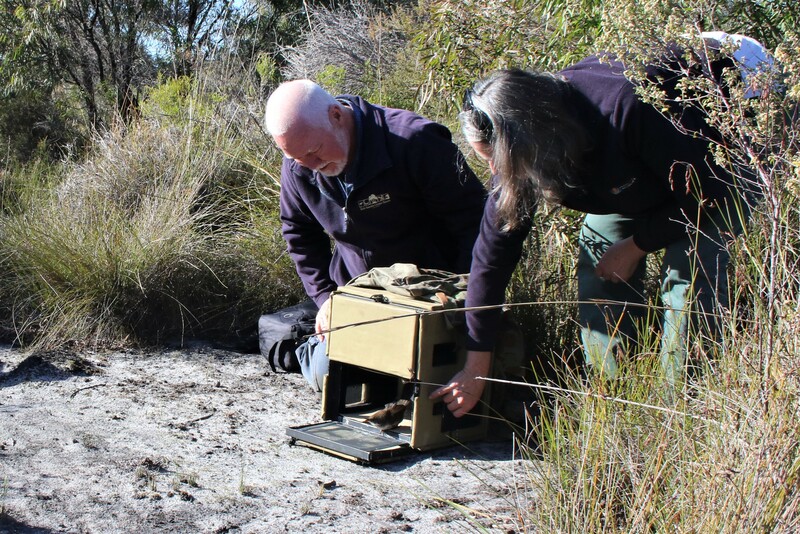 Rob Kyte and Greg Little were with me and we learnt an enormous amount about Scrub-birds - their singing behaviour, their breeding biology, where they place their nests, how males and females interact, also how to catch and then track Scrub-birds, and much much more. I'm sure it will be very valuable background for studying Rufous Scrub-birds. See the project outline for more details. In mid-2018 we (my wife Margaret and I) finally "cracked" how to reliably analyse recordings of Rufous Scrub-birds at their territories. We're now crunching out lots of data! And I am also using a hand-held sound recorder to supplement what I'm doing with fixed monitors. In particular, it's hard to differentiate mimicry from the real thing in remote recordings, whereas if I'm at a territory and the bird starts calling I can know for sure that it's mimicry. Hopefully that will lead me somewhere eventually. 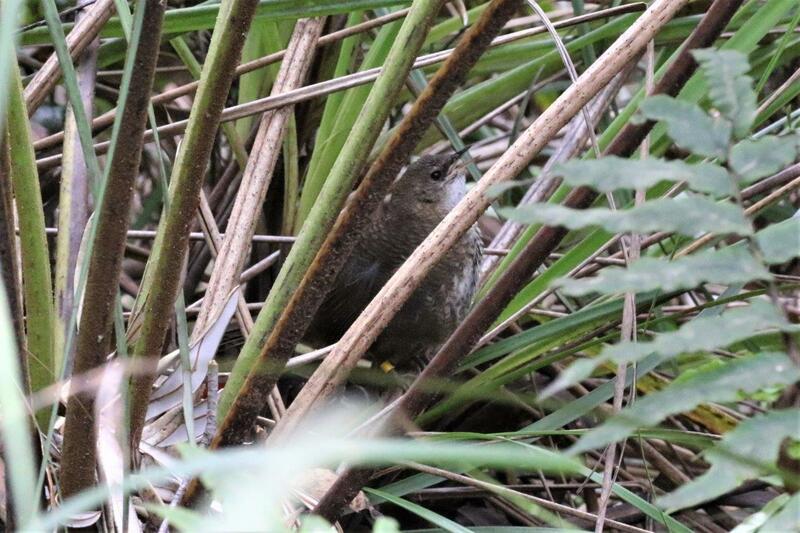 In June 2014 we (Mike Newman, Faye Hill and me) prepared a submission in support of the listing of Rufous Scrub-bird as Endangered under the Commonwealth EPBC act. The government subsequently made that determination. Our studies showed that scrub-birds are very sensitive to dry conditions in spring during their breeding season. It is expected that one consequence of climate change will be more erratic weather conditions and hence more probability of extended duration droughts. Coupled with the relatively short (4.9 years) generation length believed to apply to Rufous Scrub-birds, the potential impact to their population could be quite severe.